I’ve always thought that a dress code for the workplace was a little archaic, but I suppose I’m just progressive like that. If you don’t have a uniform does it really matter all that much if your employees dress how they want? I guess there is one in every crowd that messes up that flexibility: “oh, you mean a spaghetti strap tank and pajama pants are frowned upon here?” You’re an idiot ma’am. I work in a corporate environment which means corporate attire. I kind of bend the rules and wear a lot of dresses with cardigans over them and I keep a pair of sanuks under my desk in case I need to make a mad dash across campus to save someone’s life, because let’s face it those four-inch heels would only slow me down in that scenario. I know enough to know that if I have a meeting with an executive or a presentation to give that I need to slip into my suit jacket that hangs on the back of my door before I make one last check for lip gloss on my teeth and stride out like the successful meeting attendee that I am, but occasionally we get a treat. That treat is known as casual day. Not the kind of casual day that dares you to wear a Hawaiian shirt (shout out to my dad, this man digs Hawaiian shirt Friday and I love him for that! ), but the kind of casual day where you get to wear blue jeans to work. Unfortunately I’m the kind of girl who has two sets of clothing: office clothes and workout clothes. Casual day (blue jean friday) stresses me out to no end. I feel awkward in jeans, yet I own a pair to have on hand just for this special day. I never know which shoes to wear with my jeans because all I have is high heels and tennis shoes. High heels make me feel awkward weird dressy in jeans, like when we were 18 and would go out clubbing on friday nights (ew, I know). Tennis shoes make me feel like I’m going to go work in the yard, which I don’t do. I refuse to wear flip-flops to the office (c’mon now, flip-flops are gross), even though they are surprisingly allowed on casual day. 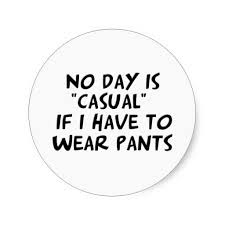 If I skip casual day and wear normal work clothes everyone assumes I forgot it was casual day and I have to answer that question all day long and that’s annoying. If I wear casual clothes, I feel frumpy and I don’t do my best work when I feel frumpy. Maybe dress code policy should encourage employees to dress in a way that’s conducive to the work they need to produce, yet presentable in case of any customer or executive interaction. Is that too simple? I just realized I have never seen you in a pair of jeans! Jeans really = my frenemy!